The European Union (EU) GDPR (General Data Protection Regulation) is the new legislation designed to favor and protect the use of Personal Data of the people residing in it. It aims to provide individuals with complete control over their data. Although the law applies to individuals and personal data resident living within the EU, many industries, organization, and services are looking forward to adhering with the GDPR compliance for the benefit of all users. Additionally, as the GDPR is applicable from May 25, 2018, many cryptocurrency service providers are also curious to know about making changes to align their practices and policies with compliance. One key objective of the GDPR is to empower individuals with various data rights. Some of those rights have no problem in aligning with the blockchain technology. For instance, the GDPR involves the right to information, providing individuals with a right to ask how their Personal Data is being shared and processed. The right to access is a good step towards increasing transparency, as it enables users to view Personal Data collected by a company, organization or service. Further, the GDPR proposes “the right to be erased.” It offers individuals data subjects the right to ask for the removal of any personal data. At the same time, immutability is the core feature of blockchain technology, as there is no central authority to oversee the erasure of personal data. Therefore, this part of the GDPR becomes a challenge for open blockchain networks that store personal data of users on the blockchain. Also, read this article to know how Private Blockchains come to the rescue here. If you’re a user of cryptocurrency services that include crypto exchange software platforms, cryptocurrency wallet development, and peer-to-peer marketing, you might have got numerous emails in the last couple of months asking you to revise the terms and privacy policies of service. 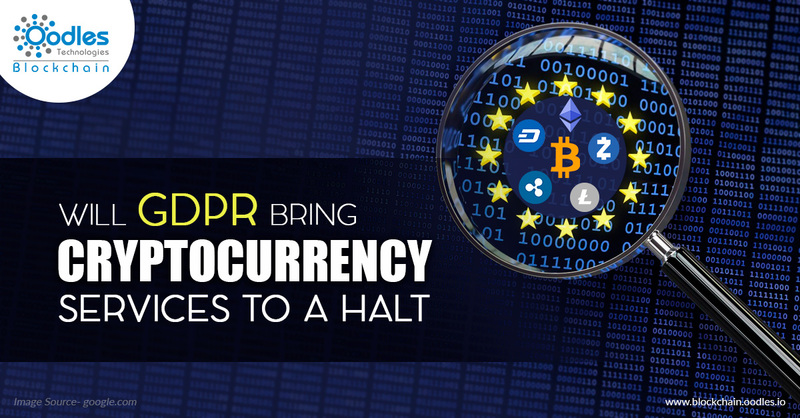 While the precise details of these changes are a subject of variation, here is a synopsis of the GDPR and Cryptocurrency services, and, of a few trends that cryptocurrency service providers will need to comprehend to become GDPR compliant. In preparation for a user’s request to access, modify, move or remove personal data, we can expect some cryptocurrency services to limit users to the use of only a single account. Also, we can expect these services using software and tools that will show all personal data of an individual in a single location, and the ones that will enable users to make requests related to their data. The GDPR bounds service providers to provide precise, clear and laymen-language explanations of why and how an individual’s data is in use at a granular level. Thus, offering EU citizens the opportunity to know; if used for regulatory compliance, for operating a given service, or for revenue-generation and advertising. Often, service providers use third-parties and allow them to access and process users personal data as a part of service delivery. These third-parties may be using your data for numerous purposes, including transaction processing, identity verification, service tracking, and identifying &fixing bugs and service errors. Here, updates to terms and privacy policies of service must highlight where third-parties are being used to utilize an individual’s data. To a certain extent, it enables users to understand the background process and allow them to comprehend more about the cryptocurrency services or any other service provider you have chosen to conduct the business and who they associate with to grow it.